all i can say, is the support on here is what keeps me going, and not so alone, i wont to start a coffee group in my home town, for people with brain disorders, as there isnt any support for people here, and just to help eachother, have a sounding board, have backup support system for people who dont have anyone to turn to." 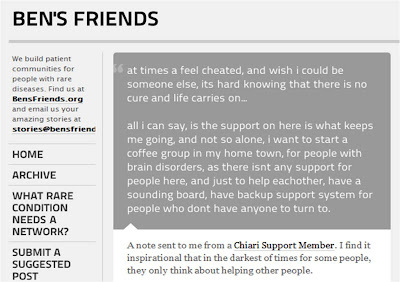 A note sent to me from a Chiari Support Member. I find it inspirational that in the darkest of times for some people, they only think about helping other people. We're raising money for Ben's Friends Support Groups. We've grown so quickly that we're having hard time supporting all the networks ourselves financially. If you'd like to contribute, here is another amazing person that is raising money for us. We'd be grateful for the support and so would the 6,000+ patients we serve.